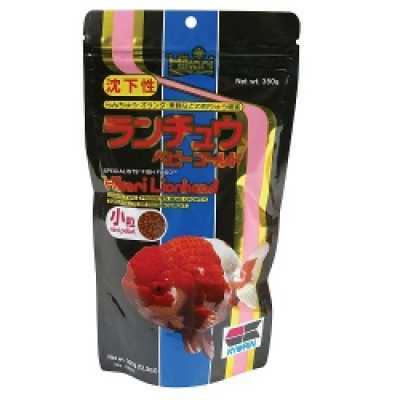 Hikari® Lionhead has been scientifically developed to promote growth and the prominent lionhead shape of goldfish such as Ranchu, Oranda and Azumanishiki. These lionhead goldfish have a rare and exquisite beauty which makes them the elite class of all goldfish. Belief that natural, live foods were indispensable in creating the desirable lionhead shape were rebuffed after our long and strenuous laboratory research. Hikari Lionhead has been developed to produce superior results, while eliminating the parasite and bacterial problems associated with feeding live foods. Sinking Pellet That Will Not Cloud The Water: Will not dissolve over time; Requires more monitoring of the amount fed; Helps reduce water quality problems; More economical than flake food. Contains Stabilized Vitamin C & Amino Acids: Supports immune system health; Promotes rapid, true-to-form growth; Promotes a long, healthy life. Excellent Daily Diet, No Supplementation Necessary: Outstanding nutrition; Superior color enhancing capacity through Bio-Technology; See exquisite colors not normally expected. Feeding Suggestions: For goldfish kept indoors, feed 2-4 times daily, provided water temperature is about 50°F. For goldfish kept outside the amount to feed will vary according to the season. During spring and autumn, feed once daily during the warmest part of the day. During summer feed freely during daylight hours, your fish have their best appetite during this season. During winter, feed Hikari Goldfish Wheat-Germ due to it's high digestibility and easy assimilation during this period when your goldfish's digestion cycle slows down. Please do not exceed the amount your fish will eat within a few minutes of feeding. Remove all remaining food after the feeding period to avoid over-feeding and the water quality problems associated with this action.